For our first instructional blog post, I thought i'd jump into one of the manoeuvres that pupils tend to struggle with... The dreaded Reverse around a corner! If you're finding it difficult, check the diagram at the bottom of this post for an illustration. Using reverse gear is difficult for new drivers. The car steers differently, the front wheels become, in effect, the rear ones. When you drive forward you can see the car turning when you steer. In reverse, you have to wait for the steering to take effect. · Without swinging out too wide. · Stop in a safe position. 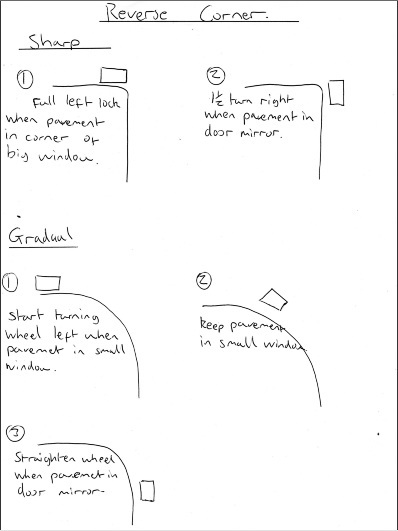 As long as you stick to the following sequence and remember to check for hazards, then you will have no problem with this manoeuvre on your test! On the approach, draw up to the kerb on the left. Remember to use the MSM procedure! Cancel your indicator. Note any obstructions and the type of corner as you drive past the road that you'll be turning into. Draw up about 0.5 metres from the kerb and about 2 car lengths past the junction. If you used your indicators make sure they have cancelled. You are allowed to take your seat belt off at this point if you find it makes it easier for you to turn around to see out of the rear window. Carry out a visual check all round. Remember to check over your right shoulder! If clear, engage reverse gear and move off very slowly. DO NOT use any signals! Looking in the rear window, you will see the kerb disappear behind the car pillar and start to appear in the rear side window. At this point turn the steering wheel fully to the left (This is a sharp corner remember). The front of the car will swing out, so check for traffic both ways and for pedestrians behind, continue very slow if clear. If a vehicle comes down the road you are reversing round, STOP. If the vehicle continues with its journey than wait until they pass and you can then carry on. If the vehicle stops behind you, then you are causing an obstruction so you will have to engage first gear and move back to where you can start the process again.On the test:- If someone comes right up close behind you after you have turned the corner, but before the examiner has indicated it is finished, wait a moment, this is to give the examiner a chance to say it is far enough, if he judges it is nearly finished. If he says nothing, then pull forward round the corner and start again, without saying a word. If you have any questions regarding this manoeuvre, or you'd like to leave us feedback, then feel free to comment and we will get back to you. Attending a driving school enables a person not only to interact with other trainees, but it also gives one an opportunity to get professional training as conducted by professional trainers. Instructors in a driving school are trained to deal with learners in a gentler way as compared to how a relative would deal with you when they are giving you driving lessons.